and dining plus adjacent spa west facing which is great when there's an easterly blowing. There is a thermal spa on site. Views from the lounge include Tiri Tiri Matangi and further out Coromandel on the horizon. Safe swimming, kayaking, and fishing are all popular in the bay. Travel time from Auckland City is 30 minutes north, it is a little bit of paradise amazingly close to a major city. On the Auckland bus route 981 bus brings you from the city to the start of The Strand. Number 8 is the third house along The Strand. Two night minimum stay apart from long weekends when its three nights. No party groups. Immediate vacation if abused. We are a married couple living in Seattle Washington State, an American and a Kiwi with two daughters and three grandchildren. Fishing, boating, reading, and swimming are part of our lives in both countries. Our relations own the historic white weatherboard house next door and an aunt had the property on the other side so as youngsters I, the kiwi owner, spent a lot of time in Waiwera with my cousins. Thermal spa on site just fill it up when needed. Easy to use directions but a phone call away for help. Spa fenced in the rear western facing garden. 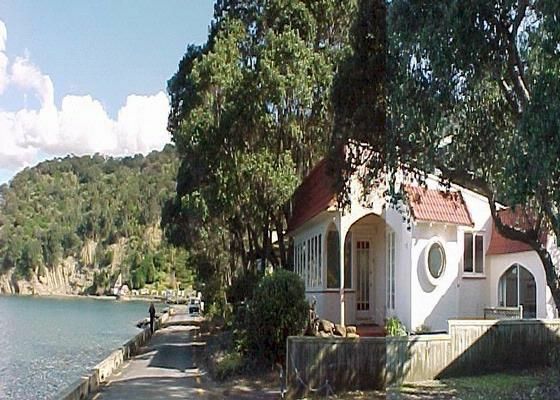 Location is Waiwera beachfront on The Strand a one way road with approximately 15 houses overlooking the bay. Two headlands define the bay with a small island at the northern end. Loved being so close to the water. Having a thermal pool was amazing too. Absolutely beautiful experience. We'll definitely be back. We enjoyed two days at this great bach. Despite some wet weather, the views were always amazing and the house was comfortable. The refillable hot pool was an added bonus. Definitely on the repeat list. Three friends enjoyed a beautiful weekend at the cottage by the sea - my second visit. There is a serenity here combined with comfort and hypnotic views from the large witney windows all along the front of the house. The natural mineral pool is quaint and authentic, and a perfect friend of slumber. The horses cantering on the beach, the kayakers and fishermen leaving at 7am all added to the pleasure. Beautiful and romantic cottage, perfect location for relaxation. Fantastic location. Very comfortable, well-equipped cottage (even has egg-cups, seldom found in rentals these days!). We loved it, and the beautiful beach, and can't wait to return. We wonder whether it might get noisy when the pools are open. But we'll go anyway! Perfect location for a restful stay. Ten minutes drive to puhoi historic village where a visit to the pub and a morning canoeing on the puhoi river are to be recommended along with a visit to the cheese factory cafe. Twenty minutes drive takes you to the parry kauri museum just south of Warkworth. While in Warkworth stroll along the wharf and see the historic boats moored riverside. Thirty minutes takes you to popular matakana village. Crazy hectic traffic on a Saturday as almost everyone goes to their famous farmers markets.